Eurasian lynx (Lynx lynx) reintroduction to the Dinaric Mountains is considered one of the most successful reintroductions of a large predator. Six reintroduced animals founded the population, which rapidly expanded from Slovenia, through Croatia, and all the way to Bosnia and Herzegovina. However, a decrease of the population size has been observed during the last 10–15 years. Considering that possible inbreeding depression would be additive to threats like poaching, traffic mortality and prey base depletion, another extinction of this species from the Dinaric Mountains is a real possibility. 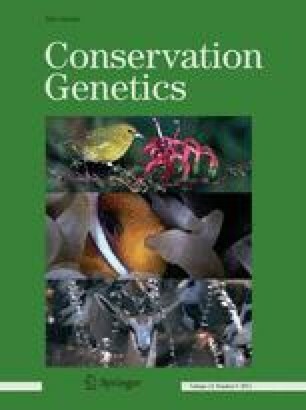 We analyzed 204 samples collected between 1979 and 2010 using twenty microsatellite loci and 900-bp mitochondrial DNA control region sequence to evaluate conservation genetics aspects of this endangered population. Both markers confirmed low genetic variability of the Dinaric lynx population, and considerable effective inbreeding (0.3) compared to the source Carpathian population. Our analysis of effective population size and microsatellite variability supported field observations of decreasing population number. As a natural recolonization is a very remote possibility, we recommend population augmentation from a large source population. The online version of this article (doi: 10.1007/s10592-013-0491-x) contains supplementary material, which is available to authorized users. We are grateful to Vedran Slijepčević, Miha Krofel, Josip Tomaić, Josip Kusak, Franc Kljun, Marko Jonozovič, Hubert Potočnik and Ivan Kos for their help with obtaining the samples. Carlos Fernandes gave us valuable comments for data analysis. This research was in part supported by the Interreg IIIA project “Transboundary cooperation in management, conservation and research of the Dinaric lynx population”. Further, it was supported by the Slovenian Research Agency Project L1-6484 and co-funded by the Environmental Agency of the Republic of Slovenia, the Ministry of Agriculture of the Republic of Slovenia and the Institute of the Republic of Slovenia for Nature Conservation. Also we are grateful for financial support provided by Croatian State Institute for Nature Protection, Croatian Environmental protection and energy efficiency fund, and Carlsberg Croatia.